You are here: Home / Loving Nature / New dinosaurs discovered! You would think that a newly discovered dinosaur species would be big news. Definitely something you’d hear about on the news. I did hear the other day that a new dinosaur had been discovered somewhere in the world so I decided that might be something interesting to have a look into and share with you, our much appreciated audience. Turns out, there has been not one, but six, ‘newly discovered’ dinosaurs this year alone! Apparently they pop up all over the place fairly regularly! Quite amazing when you think they became extinct about 65 million years ago. They lived on earth for about 165 million years and I found this quite useful analogy regarding timescales. The ‘Chicken from Hell’ or Anzu wyleie resembles a cassowary which is a large Australian ground bird. 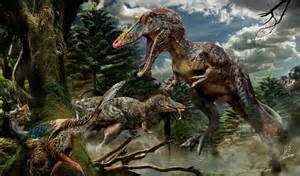 There were three fossils found in North America, specifically, from a place called Hell Creek and they are the most complete remains of a North American oviraptorosaur to have been found. Ranging from a couple of pounds in size (a baby I guess!) to 3 meters long and weighing up to 225 kg (or 500 pounds) it had long legs, a stubby tail and tall, bony crest on its head and it is thought that the animal also had feathers (although there wasn’t physical evidence found of this). 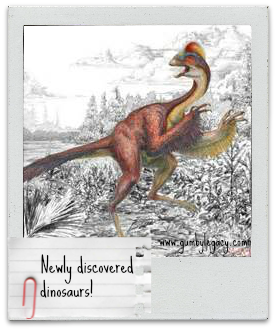 The ‘Chicken from Hell’ is believed to have feasted on a variety of vegetation, eggs and perhaps small animals. Laquintasaura venezuala is described as a ‘bird-hipped, beaked, plant – eating Ornithischia lizard’. 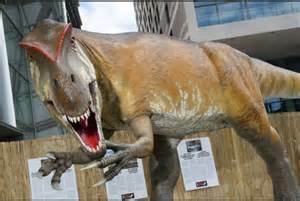 (Iguanodon, stegosaurus and triceratops are all well-known family members of ornithischia). This 201 million year old dinosaur was discovered in Venezuela and is believed to have only been around the size of a turkey or small dog. It looked pretty fierce for its size but is thought to have only eaten ferns and maybe insects. Torvosaurus genreyi was found in Portugal along with some embryos which are thought to have belonged to the dinosaur (species not this particular one!). Randomly, it is thought that this massively macho dinosaur which could measure up to 10m long and weigh up to 5 tonnes, may actually have been covered in ‘protofeathers’ which are the precursor to bird feathers. With a huge head of 1.15 m front to back and blade – shaped teeth up to 10cm long, it is believed that this beastie feasted on other large dinosaurs. Pinocchio rex (long – snouted tyrannosaur) or Qianzhousaurus sinensis belonged to the same family as the tyrannosaurus rex and was found by workmen on a construction site in China. Scientists are not yet sure why it had such a long snout in comparison to the tyrannosaurus rex but are as always, busy speculating. 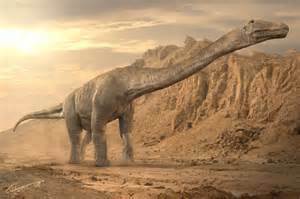 Titanosaur – the largest dinosaur believed to have lived. Another type of Titanosaur which is thought to possibly be the largest dinosaur that ever lived, was found in Argentina. Check out the size of these thigh bones! There were 150 bones form 7 individuals found and somehow, scientist can work out that the animal may have been up to 40m long, 20 m high and weighing 77 tonnes. 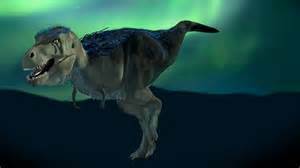 A Pygmy tyrannosaur was discovered in the Arctic. Being much smaller than its cousin the T-rex, it was still pretty lethal according to what has been discovered so far. All rather interesting. It’s amazing how they keep getting discovered although not really surprising when you think about how humans are exploring, digging, building and specifically excavating, everywhere throughout the world. Slowly, slowly covering more and more ground. Also, it is thought that there were so many different species of dinosaur that we may only know about a fraction of them. As it’s rare to find full, fossilised skeletons, a lot of what we ‘know’ is based on speculation. There may also have been many dinosaurs that never fossilised so we don’t actually know anything about these ones at all! I must say I find it all a tad confusing how ‘factual’ science can be quite so un-factual and how little is actually known about the things we are supposed to know! Have you heard of anything new that’s been discovered this year? Please let us know!